wireshark is a popular Free Software / Open Source protocol analyzer. Among many other protocols, it includes dissectors for the GSM Layer 2 (TS 04.06 / LAPDm) and 3 (TS 04.8 04.08 / RR,MM,CC). 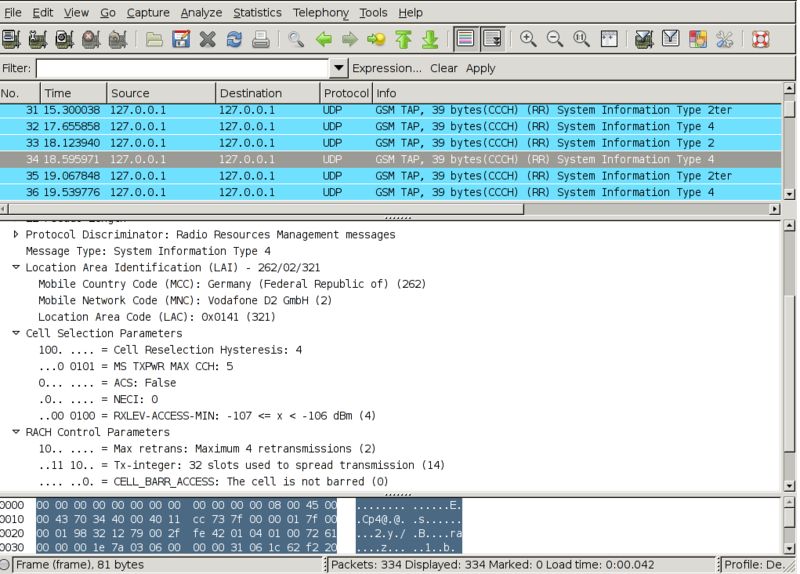 There also is a GSMTAP protocol dissector in recent wireshark versions, which allows real-time capture and decode of GSM protocol messages encapsulated in a GSMTAP (pseudo-header, which is in turn encapsulated in UDP and IP). In order to be able to dissect all protocols relevant for Osmocom, you will need to install the git version of wireshark (as of writing, the latest stable is 2.6 and it does not yet have support for GSUP for example). See #2537 for an effort to ship Debian binary packages with Osmocom patches applied. $ git clone --depth=1 "https://code.wireshark.org/review/wireshark.git"